Urutora 6-Kyodai tai Kaijû Gundan (1974) - Sci-fi-central.com. Japan / Thailand  1974  80m   Directed by: Sompote Sands, Shohei Tôjô.  Starring: Ko Kaeoduendee, Anan Pricha, Yodchai Meksuwan, Pawana Chanajit, Sripouk, Srisuriya, Kan Booncho, Chan Wanpen, Somnouk, Ai Sasaki, Sumiko Shirakawa, Takashi Nakagi, Yôko Kuri.  Music by: Toru Fuyuki. Having seen the Thai version of this complex stinker, about the only good thing about THE 6 ULTRA BROTHERS VS. THE MONSTER ARMY (Thai title: HANUMAN AND THE 7 ULTRAMEN) is the FX (directed by veteran Kazuo Sagawa) and monstersuperhero action. 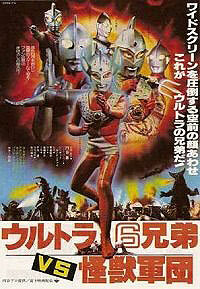 But overall, as an Ultra-fan, I have to say that this is, by far, the worst, weakest Ultraman film EVER! If people hate GODZILLA VS. MEGALON so much, THE 6 ULTRA BROTHERS VS. THE MONSTER ARMY makes it look like Oscar-winning material. Japan's Tsuburaya Productions, the creators of Ultraman, co-produced this film with the now-infamous Chaiyo Productions in Thailand, which not only co-produced another film the same year (JUMBORG ACE & GIANT), but its founderpresident Sompote "Sands" Saengduenchai would later try to basically steal the Ultraman copyright from Tsuburaya Productions using a forged document supposedly by Eiji Tsuburaya's late second son Noboru Tsuburaya (who produced this film), resulting in a bitter ongoing court battle since 1996. As of this writing, up to early 2004, Tsuburaya has won all court appeals but one (Chaiyo won merchandising rights outside Japan to the first 6 shows, ULTRA Q through TAROU, and JUMBORG ACE), and contrary to false news reports in the English-language Thai media, Tsuburaya continues to take legal action against Chaiyo. But if this is how Chaiyo wants to make Ultraman movies and shows, then it will be a nightmare for Ultra-fans. (And if you thought this movie was bad, the promos for their illegal MILLENNIUM ULTRAMAN stage show are even worse!). Review by John Cassidy from the Internet Movie Database.